Local engineer Heitor da Silva Costa, French monumental sculptor Paul Landowski. Christ the Redeemer is a large Art Deco-style statue of Jesus Christ in Rio de Janeiro, Brazil. The statue stands 38 m (125 feet) tall and is located at the peak of the 710-m (2330-foot) Corcovado mountain in the Tijuca Forest National Park, overlooking the city. The idea for erecting a large statue atop Corcovado had been around since the mid 1850s, when Catholic priest Pedro Maria Boss requested financing from Princess Isabel to build a large religious monument. Princess Isabel did not think much of the idea, which was completely dismissed in 1889, when Brazil became a Republic, with laws mandating the separation of church and state. The second proposal for a large landmark statue on the mountain was made in 1921 by the Archdiocese of Rio de Janeiro. The archdiocese organised an event called Semana do Monumento ("Monument Week") to attract donations, which came mostly from Brazilian Catholics. The designs considered for the "Statue of the Christ" included a representation of the Christian cross, a statue of Jesus with a globe in his hands, and a pedestal symbolizing the world. 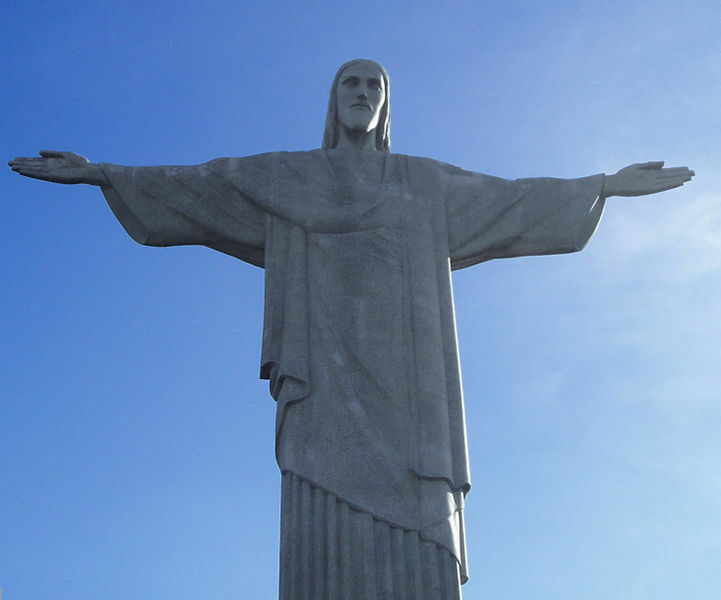 Eventually the statue of Christ the Redeemer with open arms was chosen. Local engineer Heitor da Silva Costa was chosen to oversee the construction of the new monument, to be designed by a French monumental sculptor Paul Landowski. A group of engineers and technicians studied Landowsky's submissions and the decision was made to build the structure out of reinforced concrete instead of steel, more suitable for the cross-shaped statue. Costa and Landowsky decided to make the outer layers of the statue out of Soapstone, because of its malleability and good resistance to extreme weather. The Corcovado Rack Railway proved essential to the building effort, as it was the only way to get the large pieces of the statue to the top of the mountain. The monument was inaugurated on October 12, 1931, by president Getúlio Vargas in a large, lavish ceremony. One of the highlights of the ceremony would be the lighting system, which was supposed to be switched on by Italian radio pioneer Guglielmo Marconi, from his yacht in Naples. Poor weather, however, affected the signal strength and the lighting had to be switched on manually by workers at Corcovado. In October 2006, on the occasion of the statue's 75th anniversary, Archbishop of Rio Cardinal Eusebio Oscar Scheid consecrated a chapel (named for the patron saint of Brazil - Nossa Senhora Aparecida) under the statue. This allows Catholics to hold baptisms and weddings there. Foreign Catholics may be wed at the site if they have the proper papers. There is also a somewhat arduous but rewarding hiking trail to the summit from Parque Lage park in the Jardim Botânico neighborhood at the foot of the mountain. The statue is said to have inspired Duke Pearson to write the song "Cristo Redentor," which appeared on Donald Byrd's 1963 jazz album, A New Perspective. Brazilian Bossa Nova composer Tom Jobim drew inspiration from the statue for his song "Corcovado", and also mentioned it in "Samba do Avião". Pedro Maria Boss, asked for financing for a large religious monument from Princess Isabel of Portugal. about separating church and state. donations from people all over Brazil. up 220 steps to see the statue up close.